- The Nahant Sheriff’s Department is located in the east of the Commonwealth, bordering on the northeast. Nahant is a small community on an outcropping of land that juts out of the eastern shoreline, south of Salem. Unless you dig deep into side missions, specifically for Nick Valentine, you’re most likely to come out this way for the Institute quest Synth Retention. - The outside of the Sheriff’s Department is usually fairly safe. What’s not safe is the path to Nahant, assuming you come by land. 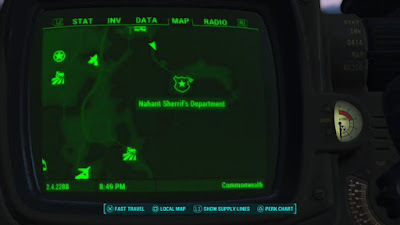 The burnt-out community just north of the thin land bridge leading to Nahant is crawling with powerful Mirelurks, and as you approach Nahant from the north you’re likely to run into a Sentry Bot. This Sentry Bot is coupled with an Assaultron and a Mr. Gutsy that hang out among a cluster of shipping crates, left to rust on a beachside pier. Not fun to take them all out simultaneously, and not recommended until you’re at least in your 30s level-wise. Check the shipping crates once they’re robot-free and you can find a suit of Power Armor in one of the rear-most crates. - Even though I said the outside of the Department is usually safe, it’s not always. If you walk to the Sheriff’s Department you may run across a Mongrel or two. Fast travel there, however, and there seems to be a good chance that Raiders and Super Mutants will spawn in and around the Department, leading to a considerable scrap. Take cover and fire back as necessary. There’s also a decent chance the Brotherhood of Steel will show up, which may or may not be a good thing, depending on your followers and overall allegiances. There’s a corpse on the ground floor with a Note. It refers to a Mole Rat Den you probably visited a looooong time ago, under the Red Rocket Truck Stop. Go there after checking the Note and you can find a Hunting Rifle of variable power among the items inside one of the containers. Climb the stairs to the second floor and you’ll see a small filing cabinet nearby. Along with a 10MM Pistol and a Caps Stash you’ll see the Eddie Winter Holotape 5 sitting on the cabinet. This Holotape is probably why you came here in the first place. Also on the second floor is an evidence terminal. Access it for the location of East Boston Police Station.